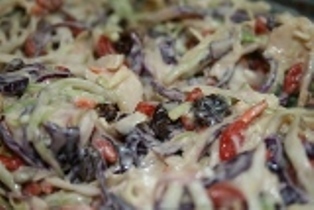 Easy Creamy Wolfberry Coleslaw Recipe was submited by my friend Sheila who maded this recipe for our Christmas Party. It was a big hit everyone love. Pour content of small bowl over salad in large bowl and mix well. Refrigerate for several hours to allow flavours to infuse.